A small food waste bin now sits in the Bridgewater Village Store’s kitchen as part of a food waste curbside pickup pilot program. All food scraps now go into the bin instead of the regular trash. Bridgewater — With a shout of “BLT!” as lunchtime peaks at the historic Bridgewater Village Store, chef Damian Krieg is doing pretty much the same thing he’s done for more than seven years – cranking out sandwiches, dishing up fresh soups and serving a changing array of specials. But there is one difference, nearly imperceptible as he finishes making a king-size bowl of cole slaw during the increasingly infrequent lulls in the action. 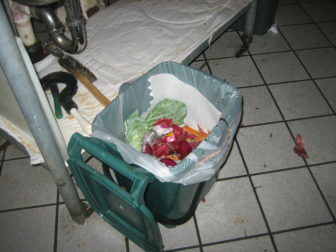 For the last three months, instead of dumping the cores of the cabbage and onions, ends of the carrots and the guts of the green peppers into the trash with everything else, he has been dropping them into a bucket beneath his workstation. It’s his new compost bucket – part of a first-in-the-state curbside food waste pickup project in this largely rural southwestern Connecticut town. That means dumping them into a larger barrel behind the store. That barrel stays locked to keep critters and other undesirables out until its contents are picked up every Friday and taken a few miles away to the New Milford Farms compost facility where they will be made into soil products. Simple? In theory, yes. But Connecticut’s efforts to wrench itself off the 25 percent recycling rate it has been stuck on for years (by doing things like finding other ways to handle its largest component – the one-third that is food waste and other organics) has been a slow go. Law changes in 2011 that mandated recycling large volume commercial food waste have been tough to implement. So Connecticut lags as other states, as well as large cities like New York, San Francisco and Toronto, and many areas in Europe, are well into food waste disposal programs. “Here we are pushing to go to a 60 percent recycling rate by 2024 and we’re never going do it unless we do something about food waste,” said Jen Iannucci, director of the Housatonic Resources Recovery Authority. HRRA covers 11 communities from Kent to Ridgefield and Redding. Waste pickup is by subscription with several dozen haulers vying for business, making a coordinated food waste pickup program next to impossible. But one of the towns — Bridgewater, where Iannucci happens to live — offered an interesting opportunity. One hauler, All American Waste, services about 95 percent of the town’s 1,100 residences and small businesses. And two of the state’s three compost facilities are nearby. Outdoor food waste containers are provided free of charge to Bridgewater residents participating in a curbside food waste pickup pilot program. She got everyone to do it for free for six months. All American provided participants with the outdoor containers and, no pun intended, is eating the roughly $1,000 per month it’s costing to run an extra truck for pickup. 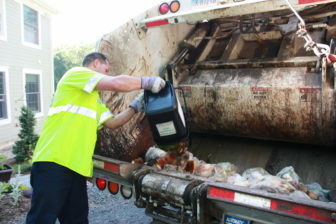 New Milford Farms is handling the waste, gratis. HRRA purchased 1-gallon counter-top bins, six months of compostable bags for them and a wad of educational materials – all worth about $2,000. And the folks who signed up for the service, (it’s voluntary) don’t have to pay any extra. It’s more expansive that the typical backyard compost pile, which is usually only “things that grow in the ground,” Ianucci said. 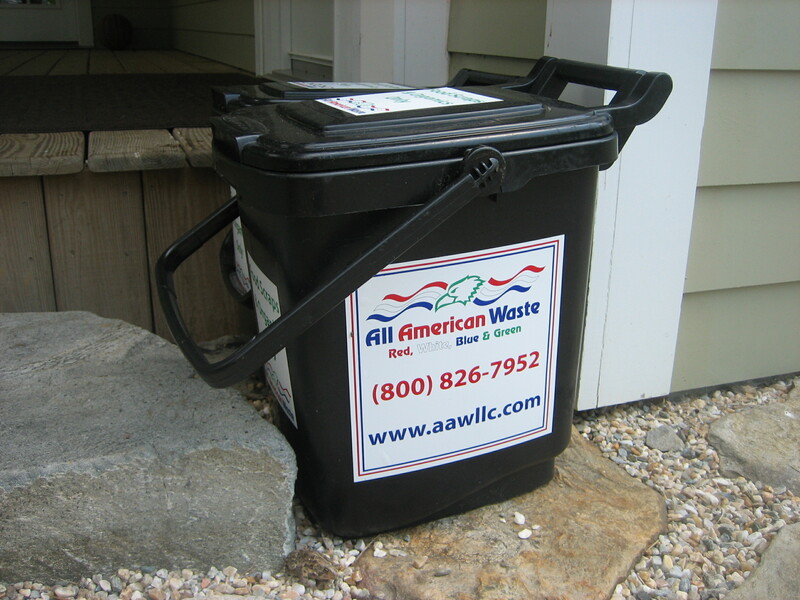 All American Waste picks up food waste at curbside as part of a pilot project in Bridgewater. Bridgewater participants can toss in meat, fish, bones, dairy, eggs and even paper towels as long as they don’t have cleaning solvents on them. In 13 weeks — about halfway through the program — 10,580 pounds or 5.29 tons of organic material have been picked up. But the fact that there were only about 120 signups — far less than half of what Iannucci wanted — may not bode well. An economic model that loses money is not sustainable, and making the program mandatory would likely bring a host of complications. Additionally, the current logistics of trash hauling make this difficult at best. “I am afraid that if we don’t have enough momentum,” Iannucci said, “it will just have been a pilot program that was this great thing that no longer exists. Kathy Alexander, the organics recycling specialist for the Department of Energy and Environmental Protection, doesn’t disagree. That is the core of the problem. 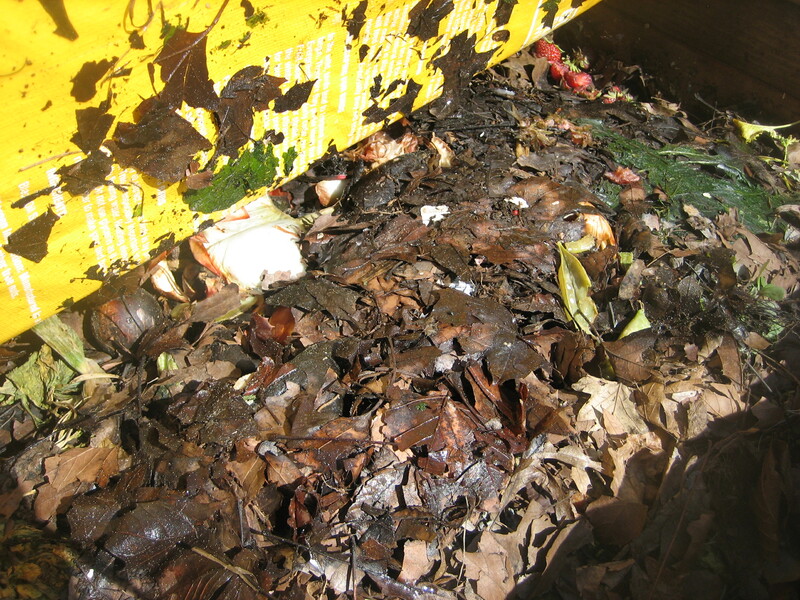 The 2011 law mandated that commercial and industrial food waste producers like grocery stores, food production operations, wholesalers and distributors that generate 104 tons of food waste a year (that’s two tons a week), and are within 20 miles of food waste processors, have to separate their food scraps and take them there. Those volumes drop by half in 2020. 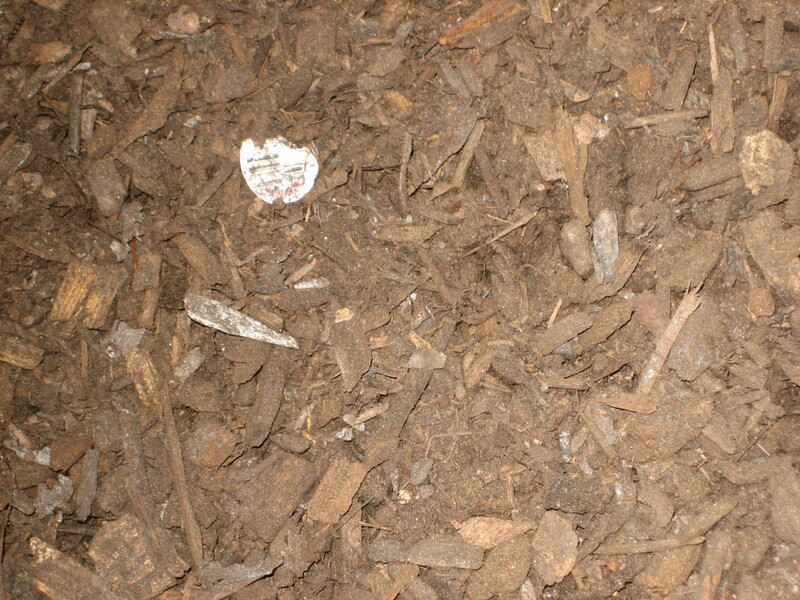 But the three processors in the state – all compost facilities that use open-air decomposition — are in far-flung corners: Ellington, with part of its 20-mile radius in Massachusetts; New Milford, and a very small one in Danbury, with its 20-mile zone extending into New York. Both Ellington and New Milford are operating at about half-capacity even with motivated clients like Whole Foods and Yale University trucking their food waste far more than 20 miles. South central and eastern Connecticut generally are uncovered. leaving haulers like All American, who recognize the interest in organics recycling, at a loss. Help may be on the way. Another option for food waste disposal is anaerobic digestion – a biological process not unlike a cow’s stomach that turns food waste into combustible gas. In an anaerobic digester, that so-called biogas is harnessed for electricity with some compost as a byproduct. Also back in 2011, the legislature mandated that the newly created green bank –the Clean Energy Finance and Investment Authority – establish an anaerobic digester pilot program for up to five projects. But it’s taken three request for proposal processes since April 2012 to get takers. The problem was an original stipulation that all the power generated by the digester be used at that site. But that was typically way more power than needed, so on the third try it was changed to allow the power to be distributed. That made the difference. 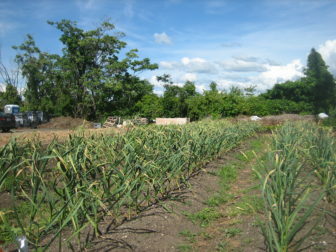 CEFIA has approved four projects for financing assistance. And the two largest ones, (and furthest along in terms of permits and other approvals) are both in Southington — a town far more accessible to central Connecticut’s largest food waste generation areas along the I-95, 91 and 84 corridors. One is an $11 million project by Quantum Biopower, a division of the Supreme Group, whose main business is land clearing that produces large amounts of wood waste, which is added to food waste for classic composting. 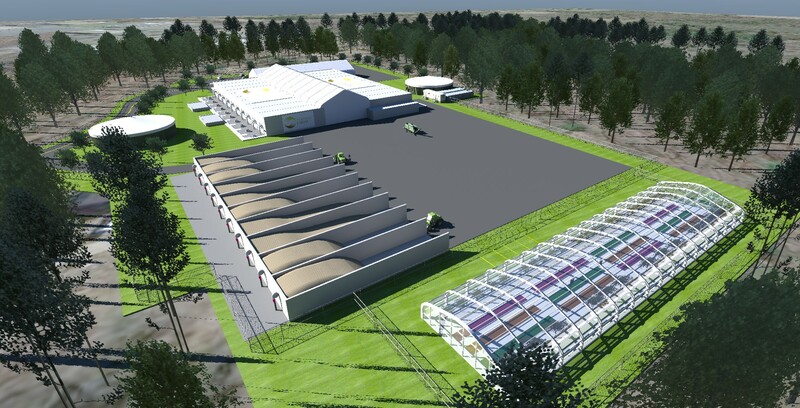 Rendering for a food waste anaerobic digester planned in Southington by Turning Earth Central Connecticut. It would use 50,000 tons of food waste and 25,000 tons of other organic wast to generate 1.4 megawatts of power. Their project, on a 55-acre property they already own, would use 40,000 tons of food waste a year to generate a little less than a megawatt of electricity. A megawatt can generally power about 1,000 homes. Quantum would use about a quarter of the power and sell the rest. Quantum already has a food waste hauler in place and contracts with a large food distributor and three food venues including the Aqua Turf Club banquet facility and the Southington Country Club. Southington has approved the necessary local permits and the state ones are being reviewed by DEEP. Turning Earth Central Connecticut is behind the other even larger Southington project. A $20 million facility, it will use 75,000 tons of organic waste a year, two-thirds of it food waste, to generate 1.4 megawatts, although it’s not clear who will buy the power yet. The company has a 10-year agreement with options for two five-year extensions with the mega trash hauler Covanta. Turning Earth also has permits from Southington and is awaiting approval from DEEP. The two other CEFIA-approved projects are in Ansonia and Bridgeport. Bridgeport’s would use sewage sludge along with the food waste, which would likely make the resulting compost unsuitable for soil, however. While people experienced with anaerobic digestion are included in the projects, overall these are companies that have never done such projects or even dealt with food waste. Covanta, for instance, has only done trash to energy plants that burn waste. But DEEP Commissioner Rob Klee, a trash expert, sees these and the Bridgewater pilot as evidence that the state’s overall trash strategy, not just how it deals with food waste, is beginning to work. Legislation approved in the most recent session includes the restructuring of the Connecticut Resources Recovery Authority and establishes Recycle CT as a non-profit resource. “We’re seeing exactly what we had hoped for,” Klee said. “When the infrastructure is there, towns will start taking advantage of it. New Haven Farms is beginning a food waste bicycle pickup program to help provide the compost they need for their eight urban gardens. Wooden compost bins are in background. He may get his next example in New Haven where New Haven Farms, a series of eight tiny urban farms that are principally for low-income wellness programs, is about to begin an expansion of its on-site composting to an $8 per week subscription program for food waste pickup. Not only that, the food waste – plant material only – will be picked up by bicycle. Executive Director Rebecca Kline said it closes the environmental loop and helps them with one of their biggest expenses – compost. Without the freebie incentive that Bridgewater has, the program theoretically is more economically sustainable – if people are willing to spend the money. She thinks they will. “Either they’ll have an environmental sort of inspiration or they’ll be really excited to donate to our organization,” Kline said. A subset of the financial model issue includes the gnarly problem of contamination. For a food waste recycling process to work cost effectively, it needs to be free of things like plastic wrapping, containers and other extraneous items that break down more slowly than the food in a compost pile, known as a wind row, or in an anaerobic digester. New Haven Farms is beginning a food waste bicycle pickup program to help provide the compost they need for their eight urban gardens. Even so, a large compost pile in an adjacent, far less pungent barn, was dotted with dime size white produce stickers. “That’s the last thing that we’ve just got to figure out how to get that out as a contaminant,” Bieber said. But many note that Bridgewater’s program is voluntary and they openly worry whether contamination would worsen if food waste separation became mandatory. And it’s only one of several things that has the HRRA’s Iannucci worried her program won’t make the shift from pilot to permanent. 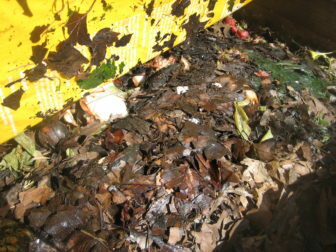 A compost pile made from food waste at New Milford Farms is dotted with stickers from produce. Such contamination remains a gnarly problem for food waste processing operations. And no one truly knows whether people will be willing to sort out their food waste and then pay to have it picked up. But Greg Bollard, vice president of the Bridgewater Village Store and the guy who signed on to the pilot eagerly, chose to take a more optimistic view of what might happen if he and his neighbors had to pay for food waste pickup. “I think the expectations have to be real,” he said, noting that food waste pickup would save him money on the rest of his trash. “Those that are vested in it and doing it are generally people that are passionate about the environment, passionate about the community, passionate about the area. So I don’t think if they had to pay a extra few dollars per month it would dissuade them one way or another. Connecticut's new attorney general is taking on the Trump administration's environmental rollbacks. The gas tax is at the core of the tolls debate. Climate change is at the core of the gas tax. But switching to electric vehicles will mean less gas tax revenue. Connecticut’s package stores have proposed a 10-cent “recycling fee” as a compromise alternative to the 25-cent deposit Gov. Ned Lamont recommended last month. The Millstone Nuclear Power Station and Connecticut's two utilities beat a negotiating deadline to keep the plant running for at least another 10 years.